When we first moved into our house (August, 9 years ago), we noticed this odd circular rainbow on the wall of our kitchen in the morning. A bit of investigating revealed that the light was coming through the peephole in our front door (that would be directly behind the photographer's back) and refracting into the circular rainbow. The kids dubbed it, "Mr. Rainbow"! Refraction is the fact that different colors of light bend by different amounts when they pass through curved glass. It occurs when the sunlight passes through the curved glass of the peephole. Since sunlight is a mixture of all of the colors of light, the lens splits the light, creating a rainbow. Don't have a peephole? If you buy an inexpensive prism, you can show this to the kiddies with sunlight. Mr. Rainbow also tells us about the changing path of the Sun throughout the year. Not only does the Earth orbit the Sun, but the angle at which it faces the Sun changes, giving us the seasons of the year, and changing the path of the Sun through the sky. Since our house faces east, Mr. Rainbow shows up in the morning, but only during certain times of the year. In fact, it always seems to first appear just as the kids' summer vacation is ending and we're nearing the start of the school year. Do you have a Stonehenge in your house? Or at Grandma's? You can explain to the kids that a couple of thousand years ago Celts built a primitive astronomical observatory based on their observations. You may notice the rainbow in your house because of the refraction through the peephole, but the ancient Celts noticed the position of the Sun changed throughout the year. 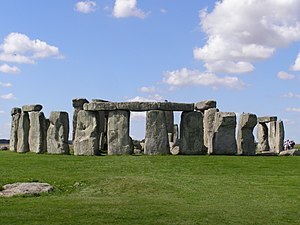 The stones were aligned with the position of the rising Sun on the summer soltice--the longest day of the year.